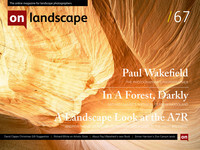 We're very pleased to be able to include content from a PDF designed by Eddie Ephraums, about Paul Wakefield's new book "The Landscape" which includes extracts from Paul's notebooks, page spreads and also two short essays by Joe Cornish and David Ward about Paul's work. Paul’s work was hugely influential for me when I began to toy with the idea of being a landscape photographer in the early 1980’s. I had just left college and was working as an assistant for various studio based photographers in central London when I was lucky enough to be introduced to Paul.I spent half a day with him, chatting and looking at some of his images. This was a turning point for me. His photographs inspired me to move away from the documentary work that I had been making and to leap into the unknown and become a landscape photographer. Over the course of the 1980’s Paul released four books of images of the British Isles, starting with Wales the First Place. Looking at these volumes, the thing that makes Paul’s work stand out for me is its integrity. Here was an artist who knew how he wanted to portray the landscape and who didn’t pander to photographic fashions. as an advertising photographer. It was obvious to me that, cut loose from the constraints of working for a client, he could simply concentrate on his vision. Paul is a master at organising visual complexity. I have long believed that visual distillation is at the heart of photographic art. In my own work I strive to find some visual essence and to reduce my compositions to a spare, graphic minimum. But looking at Paul’s images makes me feel that my images veer at times toward the simplistic. Paul often places his frame around scenes that might at first seem chaotic. In the hands of an artist a photographic frame, by containing the subject, can make clear patterns and juxtapositions that would otherwise seem inconsequential or even irrelevant. As the American curator John Szarkowski put it, “[The frame] is to the photograph as the cushion is to the billiard table.”, restraining our gaze and making us take notice of what is within. Paul’s images consistently expose subtle tonal and visual relationships that surprise and delight me. But great photographs are about more than structure; they should imbue a mood or emotion in the viewer. The trick is to somehow transcend description. Ironically, visual information weighs down every photograph. But to achieve meaningful depth we need to soar into the realms of allusion. I frequently find Paul’s images mournful or melancholic. This is a refreshing change from the sometimes sickly-sweet often uncritically celebratory message that seems to be most prevalent in landscape photography. For me Paul’s images are also often meditations, quiet entreaties to look. It is an indication of the strength and uniqueness of Paul’s work that, inspired by it as I was, I determined to travel not as an imitator but rather to try to find my own way. I think this ability to open ones eyes to a whole new realm of possibility, to free one of the shackles of conventionality is one of the signs of true art. And this is why he is one of my heroes. Paul’s notebooks clearly illustrate his connection with the landscape and his depth of feeling for it – evident in his photographs within the book. It seems incredible that Paul Wakefield’s photographic books from the early and mid-1980s were made so long ago. Looking back through them now it is true that the printing in original thirty-year old copies does look a bit dark, and the colours subdued. But the images retain an extraordinary integrity, freshness and originality. When I first studied landscape photography, the culture was still predominantly black and white. Nor was this just a legacy of Ansel Adams, Edward Weston and the American tradition, for there was an energetic movement of fine art photographers in England at the time, centred on Derby, with Paul Hill, John Blakemore, Chris Killip, John Davies, Ray Moore and others all practising monochrome image making. In many respects, colour was seen as not a serious concern, either purely recreational, (for amateurs) or if in the commercial sphere then closely affiliated with Walt Disney studios (to put it politely). prints from those negatives gave extremely good, and relatively affordable results. At this time films themselves were improving, and the first system filters introduced the possibility of balanced results, between sky and the land, in a way that was previously near to impossible. Nevertheless, the limitations of film camera systems put the cost and technical difficulty of creating exceptional landscape photographs still at a very high level. Craftsmanship and artistry were needed in equal measure. The photographers who pioneered the rise of colour photography were predominantly earning a living in the commercial world (Charlie Waite was a notable exception). Advertising, design assignments, corporate annual reports, and a burgeoning editorial market provided (by todays standards) enormous amounts of money and creative opportunities for a generation ready to pick up the baton from the superstar photographers of the Sixties.Of these, Paul Wakefield stood apart. As well as work in advertising Paul’s books, on the landscapes of the British Isles, were known to every aspiring landscape photographer of the day. He had a high profile collaborator in the writer Jan Morris, but it was Paul’s images that sold these books. I am not sure whether the publisher, Aurum, was aware that these books would cross a threshold from fine travel to fine art, but essentially that is what they do. To most of us, Paul set a new benchmark with this work, and it is inspiring to note that these same images have retained their aura and magic into the present day. They do not look dated or tired because they were made with an authentic vision, with integrity and with confidence. When I peruse his books today the images remain familiar because I absorbed so many lessons through them, about composition, about colour, about texture, mood, atmosphere; about photographic quality in general. On page 114 of Scotland, the place of Visions the superb crystalline patterns of the ice, the fine details, the suitably blue colour cast, the flow of the river, and the perfect balance between foreground and background is, you could say, a template for an idea that I have personally used many times since. While I would hope I have not simply copied Paul, you could say that he showed me/us what was possible with images like this one. Not that he was the first to make such an image with a view camera. But he was certainly one of the first to develop this style in the British landscape, and in colour. A willingness to experiment, and versatility are obvious attributes of Paul’s approach too. I love the portraits to be found throughout his books. Most are decidedly unconventional, a curious mix between formal and candid, and some are very cleverly lit. His landscapes are not by any means limited to vistas either. There are beautiful natural details, abstractions, curiously framed collusions of close up and distant, elevations that might have been made from a plane, and extraordinarily mournful, atmospheric fragments of woodland. A sample spread from Paul’s 1980s book, Scotland A Place of Visions, for which he had very limited control over the colour management and printing. One of the things that impressed me most when I first acquired my copies of Paul’s books was his apparent “ignorance” of the weather. Whereas it was the default approach of all working landscape photographers that blue skies and sunshine were required, if only to keep publishers happy (not to mention the tour operators and others who might subsequently license our work) Paul Wakefield’s photographs are made in all weathers. The epically gloomy image of The Cuillin Hills, on pages 76/7 of Scotland, the place of Visions is a great example among many. Whether it was limited time available, or aesthetic and philosophical preference for these conditions I am not sure, but the photographer’s mastery of these conditions is such that we are left feeling that this was exactly the right light, the right weather to be making this or that particular picture. The result is that each book has an emotional and aesthetic depth and vision missing in virtually all other travel books of the time. And there is too a sense of mystery and longing, an indefinable atmosphere and intangibility about the images that makes them rewarding, time after time. While he continues to be recognised as one of the great photographers of his generation in the relatively narrow field where he makes his living, for far too long Paul Wakefield’s images have been outside of the mainstream. He remains the expert photographer’s favourite landscape photographer. Hopefully this book will lead to a much wider appreciation of his immense contribution to the art of landscape photography.